In last month’s newsletter we asked if our employment expansion had already ended. After speeding up in late 2014 and early 2015, employment growth hit the brakes in March and April. In May, we rebounded with 3,400 new jobs (seasonally adjusted) — up by 18,400 from one year ago. As we said last month, economic recoveries are not always characterized by smooth, consistent acceleration. 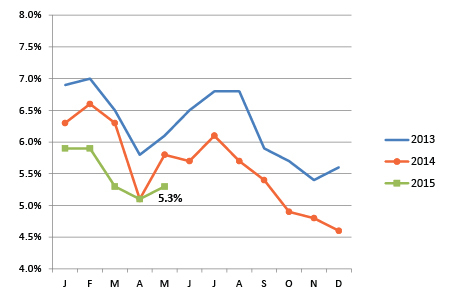 KC's spring employment dip was likely just a slight misfire. Our economic engine appears finely tuned and ready to propel the region forward. Speaking of engines, Kansas City’s employment growth over the past year is even more remarkable when we look through a bistate lens. 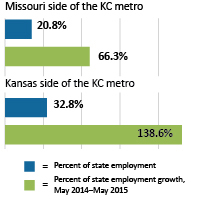 The chart below shows just how important the Kansas City metro is to the economy in both states. The blue bars show the percent of total state employment that is located in the Kansas City metro. Jobs on the Missouri side of the Kansas City metro make up 20.8 percent of the state total. In Kansas, 32.8 percent of all jobs are located within the Kansas City metro. The metro plays an even greater role in job growth, far exceeding its share of jobs. In Missouri, two-thirds of all new jobs created in the last year are located in the Kansas City metro. In Kansas, the metro accounts for 139 percent of all new jobs! That means that were it not for the Kansas side of the Kansas City metro, the state would have experienced a loss in employment over the past year. Clearly, Kansas City is not just riding this job-growth bus — we’re driving it. Neither state’s employment growth has been all that impressive in recent years. The fact that the metro is moving forward at its own pace perhaps speaks to a new economic reality, where regions can grow, innovate, and plug into the global economy on their own — leading, rather than following, state and national trends. 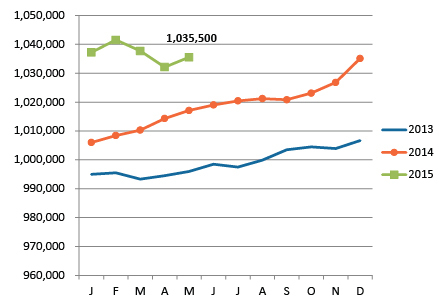 After a two-month decline, regional employment rose in May, to 1,035,500. Employment remains well above where we were one year ago. After dropping in March and April, Kansas City's unemployment rate ticked up to 5.3 percent in May. NOTE: We typically use the seasonally adjusted unemployment rates here, but that data series is temporarily unavailable. The rates shown below are not seasonally adjusted. 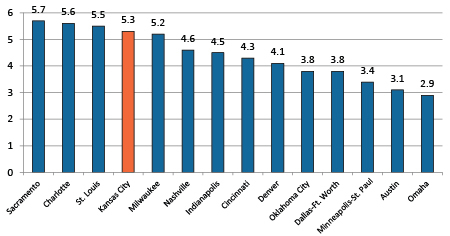 At 5.3 percent, Kansas City's unemployment rate still does not compare favorably to its peers; 10 of the 14 peer metros are doing better. 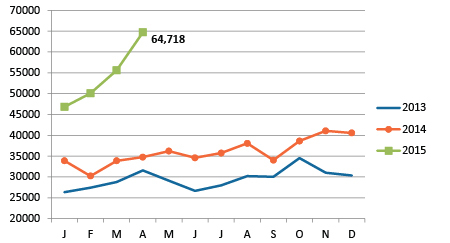 Unique help wanted ads reached new territory in April, topping 60,000. Note: At the time of publication, May data was not yet available.